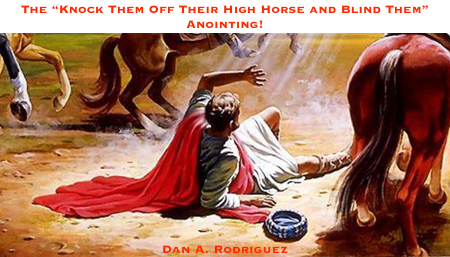 The "Knock Them Off Their High Horse And Blind Them" Anointing! What do you do when you are innocent of charges against you, and someone, or a group of people, attack, smear, slander, speak evil, give false testimony, and attempt to destroy your life? The temptation is to take vengeance into your own hands. Even though it may feel good to get a baseball bat and beat them to a pulp for their slander against you, there is a better and more productive way. There is a God in heaven that despises it when the righteous are harassed and persecuted. It angers God when people try to attack and hurt the innocent, and He will take vengeance into His own hands and repay the accusers. Yes, Paul wrote about this truth. Give room for God to get angry (have wrath) about it. Let Him have His vengeance. Believe it. Trust Him in it. Paul said even more about this little-taught subject. God will repay those that afflict you! That frees you up. Let God be the “heavy” in it. You can pray for those that persecute you and you can bless them (Romans 12:14-21). Why? Vengeance is not yours. No worries here. Vengeance is the Lord’s. He gets angry about it and pays them for the evil they have brought against you. Leave it in His hands. Read the rest of the 6 page article. It's a free PDF. Use the button below to download it.